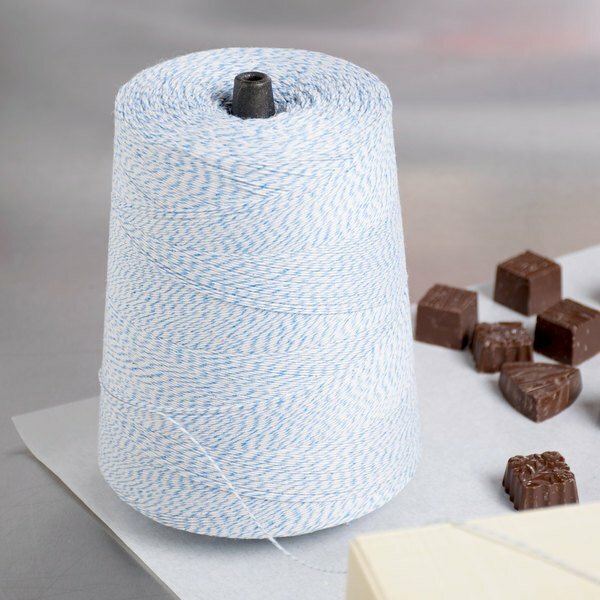 Add a personal touch to your customers' orders at your bakery, cafe, or other establishment with this baker's twine! 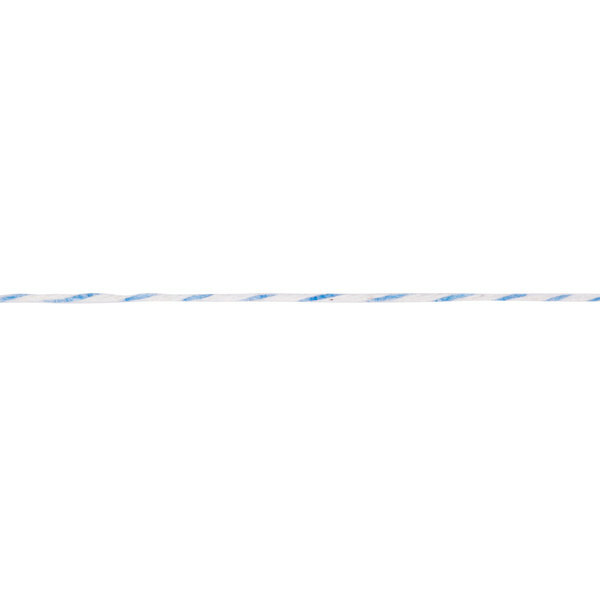 This multicolored twine is made from blue and white polyester cotton blend. This 2 lb. cone measures approximately 3400 yards long, giving you plenty of material to work with! This product is a 4-ply twine, meaning that it consists of four strands twisted together to form a single strand, making it strong and durable. Use this twine to tie your bakery to go bags, or to hold your bakery boxes closed. This colorful twine will brighten up your customers' orders, increasing appeal and customer satisfaction. This is such a bargain for the amount of twine that you get! The cone is huge and will last a really long time. I enjoy that it is more of a baby blue color than a royal blue color. Adds such a cute touch to my bakery packaging! We purchased this twine for our deli. We use it to tie the packages of bacon and deli meats that we sell. Very thin, but works just fine and is the right color scheme for our restaurant. Looks very nice but I wish I had realized how very thin this was. If you tie too tight, it will just break. Use cautiously. This bakers twine is such a great value for you money. The rolls are huge and will last along time. They bring your packaging to the next level and adds such cuteness. 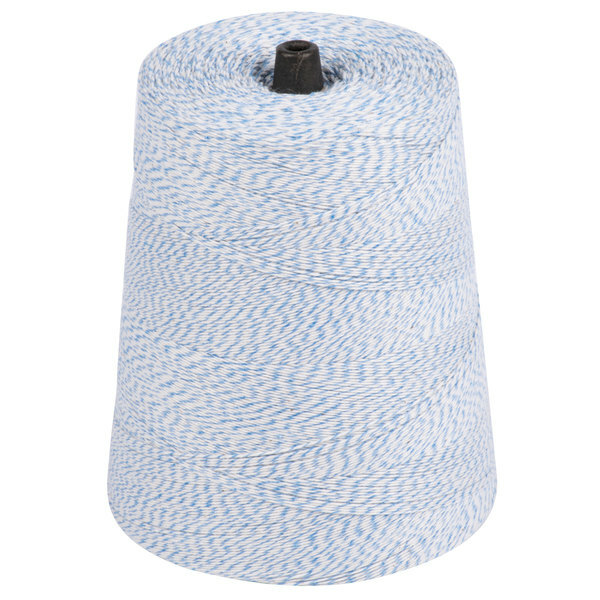 This blue and white variegated cotton baker's twine works great! Very strong and durable. You can tie up your fresh herbs and use for cooking and seasoning your meat. Bakers twine is such a handy thing to have around. I've seen it used to package baked goods as gifts and even to make garlands. Great price for how much you get. One spool has a LOT! 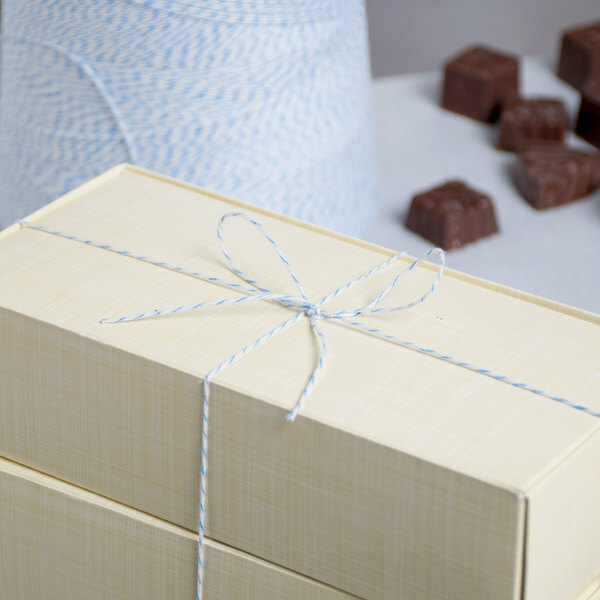 The blue twine adds a cute touch to my bakery boxes. It's good quality and strong! Webstaurantstore.com has always been at the top of my vendor list. They always a quality product at great price and this twine in no exception. Use it for deli boxes, gift wrapping and all kinds of other craft projects. Great color, well made, perfect thickness & strength. I use the twine to give my baked good packages there final touch. There plenty of twine to go a very long way. Far and away the best pricing ANYWHERE on this variegated cotton baker's twine; we shopped everywhere we could imagine and couldn't find a better product at this price. Tight wrap and easily mountable. Well done. This is a great twine that we use to tie our roasts. Not too fine of a thread, and very versatile. Also use it to hang things like pens to clipboards. This blue baker's twine is AWESOME! It is the most beautiful light blue and the value is amazing! I found a small spool of red twine at a local store for 2 yards it was half this price! You can't beat this price. We use this twine to tie our bread In paper. It's in a blue and white color and looks very attractive. This is a great way to wrap stuff. Great for baking and wrapping items. We get twine in red and blue from here and are very pleased with both products. Blue seems to be less common. The product works well for securing boxes and items wrapped in parchment paper. It is also handy for tying labels on products and packages--like on homemade canned goods. cute baker's twine to package my baked goods! The blue is a bit darker than shown in the picture. Other than that, its a great value. We use this every day in my bakery to tie around our boxes. I love the different colors and it lasts forever! Great product and price!